Beautiful Sand sculpting is something that most of us have done on the beach as children, but we didn't call it by such a fancy name. In England we call it building sandcastles but I have also heard it called, 'making sandpits'. I seem to remember my own efforts resembling 'pies' rather than castles. Sand sculpting takes no special equipment. A few household implements like scoops and pots, plastic knives and spoons will suffice. Get yourself a long handled shovel to go with these tools and you are a sand sculptor. 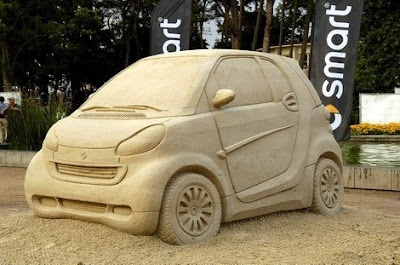 If you are fit enough and enthusiastic enough, you could even build yourself a sand car. This amazing creation was part of a promotion for the 'Smart Car' and I have a sneaking suspicion that the artist cheated. Perhaps this detailed replica is made using a mold. 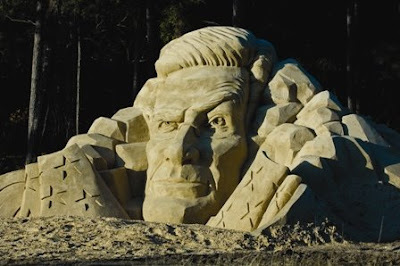 This amazing likeness appeared over night on a beach at Ocean Creek, North Carolina, US. The image was said to be a good likeness for the popular TV presenter , Stephen Colbert. The team that sculpted this amazing piece had previously been involved in a similar project depicting local election candidates. like this one decorated the beach at Zhujiajian, East China. A whole series of them depicted Olympic history. They were created by sand sculptors from ten different countries including US, Russia, and the host country, China. 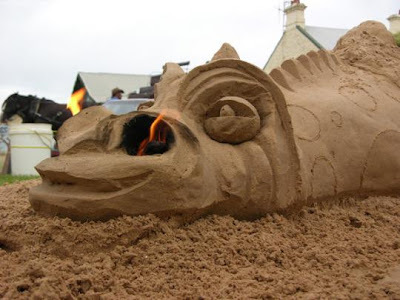 This fifty ton sand sculpture was built by a company that specialises in sand sculpting for exhibition purposes. 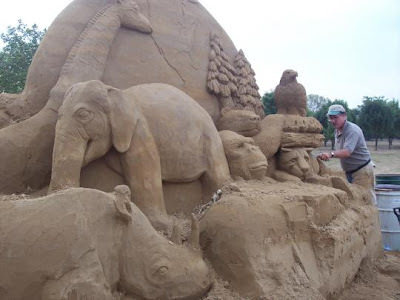 The Sand Sculpture Company of Woodstock, Il was commissioned by the City of Sculpture to produce this masterpiece. This just goes to show that with a little practise you could become famous. What are you waiting for? Get out the sand box if you don't have a beach to dig on. 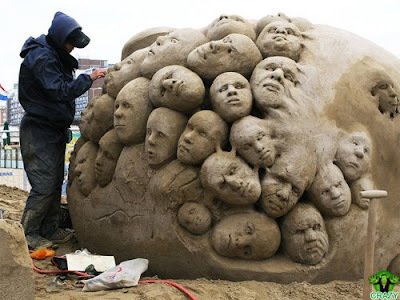 This amazingly detailed sculpture depicts human heads. You can see the sculptor working on the fine details of one of the faces. 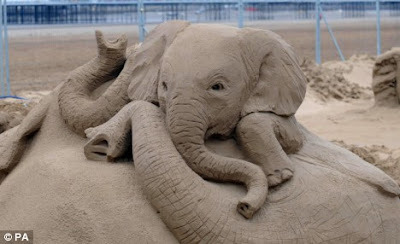 Sand sculptures take many hours to make and this one is more intricate in detail than most. All that effort to build something that soon disappears. 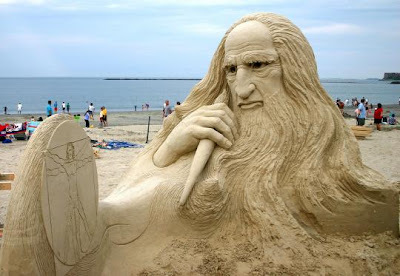 Perhaps that is the wonder of this art, it only exists for a very short time and ends up as a heap of sand again. and beard are particularly amazing. The features, especially the nose are exactly like the pictures we see of Leonardo Da Vinci. This certainly shows some amazing talent. 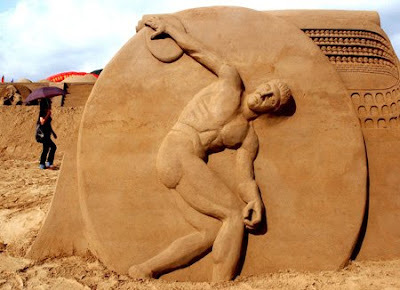 This giant Australian sand sculpture must have taken many tons of sand to build. You can see how the features were carved out and scales were carved out on the body. I wonder how many people it took to build this fantastic creature. He even breathes fire! This herd of elephants appeared on a muddy beach at Weston-super-Mare, England. They were part of the 2008 sand sculpture festival which had a theme of 'Around The World'. This herd of Indian Elephants shared the beach with Egyptian Pyramids, icebergs, lions and even a jeep and lions on safari. All of this is great fun and something that is within the reach of everyone, young and old. You may not be able to sculpt something as beautiful as these elephants, or as complicated as Leonardo Da Vinci at your first attempt, but who knows what you might achieve with a little practice.